When you sign up for a new mortgage under the Federal Housing Administration’s program, your loan will be subject to the FHA loan limits. These limits dictate the maximum amount that a person can borrow while still receiving the backing of the federal government. While some lenders might consider allowing borrowers to seek financing above these FHA loan limits, it puts lenders at a significantly greater risk. The FHA mortgage program is sponsored by the Federal Housing Administration to make homeownership more accessible to families who need a lower down payment. This agency works with private lenders to offer a sort of “insurance policy” in the event that a borrower defaults on their mortgage. In order to help them keep these guarantees under control, the FHA sets a maximum amount that they are willing to insure for the lender. Get Help Pre Qualifying for an FHA Home Loan – Click Here! How Do FHA County Loan Limits Work? The FHA loan limits are based on the county you live in and the type of home you purchase. Many of the 2018 FHA loan limits also account for the median price of similar real estate in your specific area. 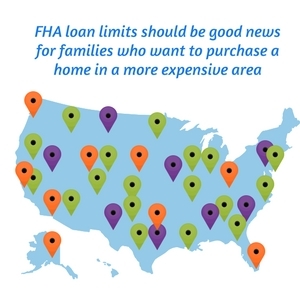 The difference in FHA loan limits should be good news for families who want to purchase a home in a more expensive area. This means that the ceiling, or the maximum amount that the FHA will insure, is going to be higher than it will be for lower-income areas. There are four distinct tiers that an area can fall into: the standard tier, the mid-range tier, the high-cost tier, and the special exception tier. Most properties and areas will be subject to the standard tier. These FHA loan limits don’t describe the maximum loan to value ratio. The loan limits simply state how much the federal government is willing to insure on your loan, meaning the amount you will be financing. You could still purchase a home that exceeds these county loan limits if you make a down payment for the remainder. Keep in mind that the county loan limits do not guarantee that you will receive lender approval for financing up to this amount. Your specific loan limit will be subject to borrower eligibility after the lender reviews key factors like your gross income, debt to income ratio, credit score, and more. The loan limits exist as a guideline for the maximum amount you could borrow, even though you might not be approved for this amount. How are the 2018 FHA Loan Limits are Established? The FHA county loan limits have increased for most of the country, effective in January 2018. As in most things, there is a specific formula used to determine what the loan limits will be in the various sections of the country. You can take a closer look at some of the math behind the 2018 FHA loan limits for each tier below. Keep in mind that there will be different FHA loan limits for properties that have multiple units. Homeowners are welcome to use this type of financing to purchase a single unit, like a detached single-family home or a condominium. However, they can also purchase properties that will be used to generate a monthly income as long as the owner plans to live in one of the properties. For example, you might be able to use the FHA mortgage to purchase a duplex or a triplex where at least one other unit would be rented out while you live in the other. You can use the FHA loan to purchase a maximum of four units on a single property, and they will be subject to additional guidelines and criteria before the financing can be approved. The standard limits apply to the majority of the nation, and they are perhaps the easiest standards to understand at a quick glance. The same loan limit will apply for every type of property from a 1-unit to a 4-unit home. Homeowners should expect to look for a home that costs $294,515 or less. How did this number come to be? The standard county loan limits are determined based on the “floor” calculation used by the government. They look at the conforming loan limit of $453,100 and take 65 percent of it for these FHA loans. The standard FHA county loan limits apply in cities that have a lower median home price. Experts calculate which areas should have this standard limit instead of the significantly higher limits from in the other tiers by multiplying the median home price by 115 percent. When the product is less than $294,515, the county falls into the standard tier. You will find that this limit also has its own mathematical calculation that is based on the floor found in the standard tier and the ceiling found in the high-cost tier. These limits apply to areas where 115 percent of the median home price exceeds $294,515 but still comes in lower than $679,650. Whatever the product of this calculation is, that is the loan limit for that particular county. There are several of these areas around the nation, but they are not as common as the standard tier. However, you will notice that there are some variations due to the way this figure is calculated. The high-cost FHA county loan limits are extremely rare to find. There are fewer than 100 of these across the entire country, with most of them being major cities such as the New York City metro area or Washington, D.C. These areas are determined by a calculation similar to that for the floor. The ceiling is set by multiplying the conforming loan limit ($453,100) by 115 percent. This figure is used for areas where the median home price multiplied by 115 percent exceeds $679,650. The construction expenses for these areas are estimated to be much higher than they are in other parts of the country. These higher loan limits are designed to give homeowners a chance to still purchase a home despite the increased cost to build it. 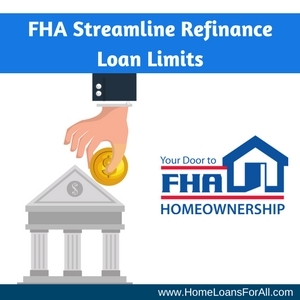 What are the FHA Streamline Refinance Loan Limits? The FHA streamline refinance loans are not subject to the same loan limits as the purchase of a new property. However, you will have to bear in mind that these refinance loans are only available to homeowners who purchased a property using an FHA loan to begin with. This means that your initial purchase of the property would have had to comply with the loan limits and standards in your area. If the value of your home has increased, this could be a great way to still take advantage of lower interest rates or to reduce the MIP on your mortgage without being subject to the FHA county loan limits. All of these requirements must be met in order for the 2018 FHA loan limits not to apply and for their property to exceed the ceiling. Understanding the FHA loan limits for 2018 makes you more apt to find a property that is better-suited to your family’s unique needs. Knowing where the FHA county loan limits come from and how they apply to your area will give you the tools you need to have a talk with your lender about a specific property. 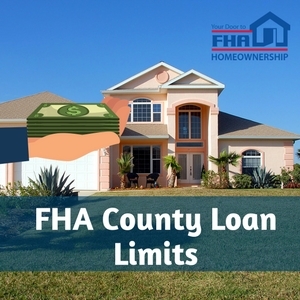 Make sure you know what the county loan limits are in your area by searching the FHA website here. Do FHA loan limits include down payment? No, the FHA loan limits dictate the maximum amount of financing they will insure for a private lender. Your down payment does not contribute toward this amount. What is the FHA maximum loan to value ratio? The maximum loan to value ratio (LTV) is 96.5 percent because it requires a minimum down payment of 3.5 percent. What is the FHA maximum loan amount with MIP? All FHA loans are subject to MIP. This means that the maximum loan amount with MIP will be the same as the 2018 FHA loan limits for your area. Does borrower eligibility effect FHA loan limits? Yes, borrower eligibility may determine the exact amount that your lender is willing to allow you to finance. The FHA loan limits are available to demonstrate the maximum amount you can borrow, but a lender may choose not to issue the full amount based on the borrower’s credit score, debt to income ratio, gross income, and other factors. Why are the FHA loan limits so low in my county? The FHA loan limits are based on the median home price in your area. Are FHA streamline refinance loans subject to loan limits? No, the streamline refinance loans are not subject to FHA loan limits.